Your guinea pig needs regular baths to keep him clean and fresh-smelling, but the suds that work on your hair are too harsh for his fur. There are several ways to clean your guinea pig using products that are gentle enough for his skin and fur. Guinea pig experts at the Australian Cavy Sanctuary do not recommend that you use hair shampoo on your guinea pig. Human hair shampoos contain chemicals that can irritate guinea pig skin and eyes. Find a specially formulated small animal shampoo at your local pet store. Shampoos labeled for guinea pigs, rabbits or kittens are gentle enough for guinea pigs. If your guinea pig is only lightly dirty, you can wash him with a warm, wet washcloth. If your pet has a dirty rear end, moisten a washcloth with hydrogen peroxide. Sponge off dirty areas with the washcloth. Powder baths offer an alternative to shampoo baths. Look for specially formulated dusting powders made for guinea pigs or rabbits. To use the powder, sprinkle it on your pet, run it into his fur and brush out the powder with a stiff-bristle brush. Bathe your guinea pig in the bathroom sink or a small washtub. Place a washcloth on the bottom so he won't slip. Pour warm water over your guinea pig to wet him, taking care not to get it into his ears and eyes. Work a tiny amount of shampoo into his fur, starting from the rear and working forward. Once he's lathered up, pour warm water over him to rinse off the shampoo. When he's clean, towel him dry. Short-haired guinea pigs need a bath only about every three months. Long-haired guinea pigs should be bathed every two months, since their coats grow about 1 inch per month. 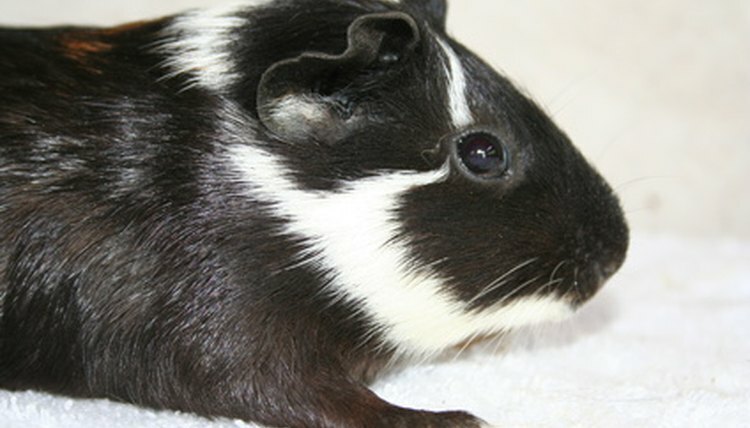 Every three months, it's recommended to use a parasite or mite wash solution on your guinea pig. Follow the instructions on the wash solution you use.